In preparing for the lecture capture pilot project (now branded Replay), a great deal of thought went into anticipating problems that may arise, how to make the recording process as unobtrusive as possible for lecturers, and how the students will want to use the system. While many of the predictions have been proven accurate, that does not mean there haven’t been a few surprises. Professor Steve Simon is a lecturer in the Department of Physics, who offers a popular series of lectures during Hilary Term on condensed matter. He was among the first lecturers to begin using lecture capture software, and 2 years worth of his lectures have now been recorded and made available to students. The students have put this to good use, but while many of the predictions concerning their use of the recordings proved true, an analysis of the related statistical data revealed something rather unexpected. Examining when students viewed the recorded lectures shows that, as expected, there was a spike from the end of April through to June 2014; confirming that students used recorded lectures as a supplementary tool to aid their revision, and to revisit difficult topics just before exam season. Similarly, October witnessed a second spike, as conscientious new students prepared for the year ahead by watching the previous year’s lectures. Also impressive was the extent of viewing. 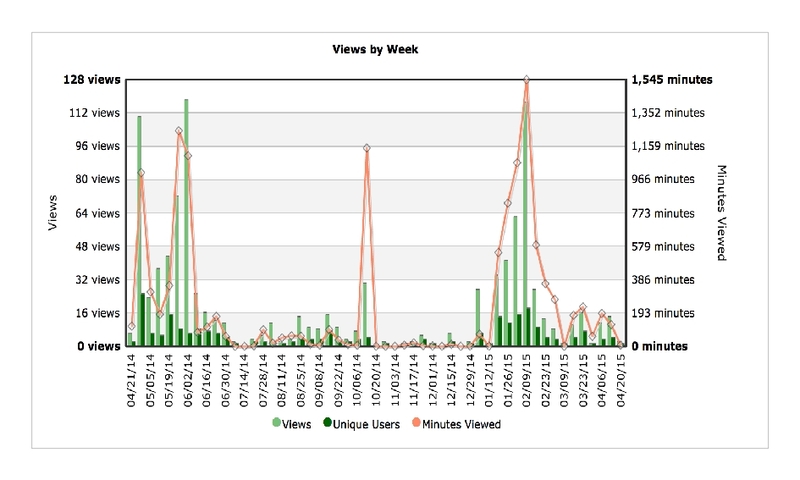 This lecture series alone received 47 unique visitors in one week, and garnered a total viewing time of 1,545 minutes in another! Yet, the biggest surprise was the revelation that viewing of the Hilary Term 2014 lecture series saw a third spike during Hilary Term 2015. This was in spite of the fact that Professor Simon was giving an almost unaltered version of the same lecture series, and that a recording of this newer version was also available to students. Puzzling as it first seems, it transpired that the students were watching the previous year’s lecture before attending the corresponding one in person. They were using the recordings to prepare for the lecture; apparently conscientiousness is not limited only to students in their first term! Worries have been voiced that recording lectures and making them available online will encourage students to miss the live lectures; however, the aforementioned spike was not accompanied by any noticeable drop in attendance rates. It would seem that students see recorded lectures as a supplement to, rather than a substitute for, their actual lectures; as a means of revising; and as a chance to re-confirm their grasp of the more difficult aspects of the subject.